Yesterday we took a look at all the goalies that suited up for the Johnstown Tomahawks this season. (You can read that blog post here.) Today we move onto the defensemen. We'll cover all players that played at least one game with the Tomahawks this season, and go in order of player jersey number. Bentzel is the type of defenseman you don't always notice on the ice until he's not in the lineup, and then you relies just how valuable he really is. He's not a flashy D-man and he doesn't murder people with his hits, he just gets the job done. In game two of the playoffs vs Port Huron, Bentzel hurt his shoulder, and missed game three. Would he have been the difference maker, getting the Tomahawks the win? He might not have, but it wouldn't have hurt to have him. Bentzel's best game, point wise, came the first home game of the season, where he received two assists in the Johnstown win over Michigan, 4-2. Bentzel never had a game all season where he was more then a minus two on the ice, and in 32 of the 50 games he played, he was either an even or a plus player. Bentzel had one fight this season, which was against Michigan's Shawn Badali. He's a '93 player which mean he is able to play one more season in junior hockey, which I hope he spends that time back in Johnstown. Spencer was fourth among the team's defensmen in scoring during the regular season. He was also the Johnstown Tomahawks first ever NAHL Draft pick in the 2012 draft. He is also one of three Tomahawks' players that made a college commitment, though his commitment came before the regular season. Though he still able to play at the junior level, like Truehl, will be heading to college next season, University of Vermont. Spencer was probably the slowest defensemen on the Tomahawks roster but seemed to be very confident with the puck. Spencer had one game winning goal which came against Jamestown in a 3-1 victory on March 8th 2013. Spencer also had one fight while playing for Johnstown. That fight was against Jamestown's Elliot Tisdale, after Tisdale hit Casey Nelson from behind, causing Nelson to miss the rest of the regular season with an injury to his shoulder. 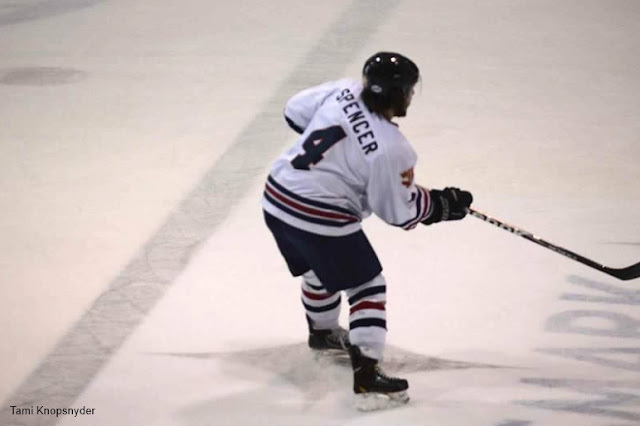 Spencer had four multiple point games this season with his best effort coming on 12/21/2012 at Port Huron, where Spencer recorded three assists in the teams 3-2 win. At the beginning of the season his defense was terrible, but he got better as the season went along. One thing that I couldn't stand but luckily it never back fired on him, was when he'd make a defensive pass in his own zone, through or close by the crease. It'll be interesting to see how he does for the University of Vermont, and to see if he'll have a career in pro hockey. Note: A reader commented that Ian Spencer is coming back to Johnstown next season instead of going to the College level. Nelson was hands down the Tomahawks best offensive defensmen and probably the team's best skater. Watching Nelson skate, it looked like it was effortless on his part and just something that came natural, like walking. Nelson was ninth in the league in Defensmen scoring with his 32 points. 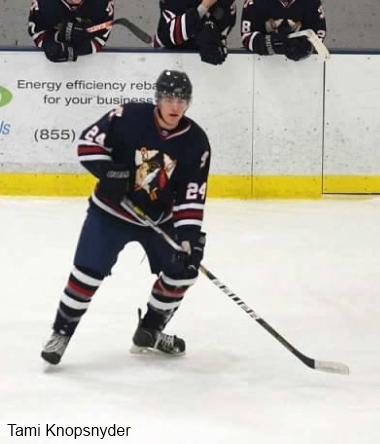 Nelson was the third player on this Tomahawks team to make a college commitment, selecting to go to Minnesota State-Mankato next season. We broke the news here on our blog, and you can read that article here. Nelson didn't have a fight this season for the Tomahawks but did have eight multiple point nights during the season. He also scored two game winning goals, one coming against Janesville (10/05/2012) and the other coming vs Kalamazoo (11/09/2012). I wish we could have another season with Nelson on our team, because he's that good. If there's any player on the team that has the best shot to have a good pro hockey career, my money would be on Nelson. He's got the wheels, he's got the shot, and he plays good defense. What more could you ask for? Mitch Hall spent half the season with the Jamestown Ironmen before he was traded to the Johnstown Tomahawks on 1/9/2013 for draft picks (if I remember correctly). Hall played 22 games for the Ironmen posting only three points. Once Hall became a Tomahawks he posted 13 points in 24 games. Hall is another D-man who can play at both ends of the rink. He was one of a few Tomahawks' players that ended the season as a plus player (+1). Mitch Hall didn't drop the gloves with the Tomahawks, instead he did his damage on the scoreboard. The best game that Hall played in Johnstown, stat wise, came the second to last game of the season against his former team. In the 5-0 win over the Jamestown Ironmen, Hall recorded one goal, and one assist, while posting a +3 on ice rating. Hall also scored one of the Tomahawks two short handed goals of the season. Hall was a great pickup by Rick Boyd and hopefully he'll come back to the team next season. He's not a big guy back on the blue line but like we said, he still gets the job done. When pressured in his own zone he stays calm and makes the simple, easy play. 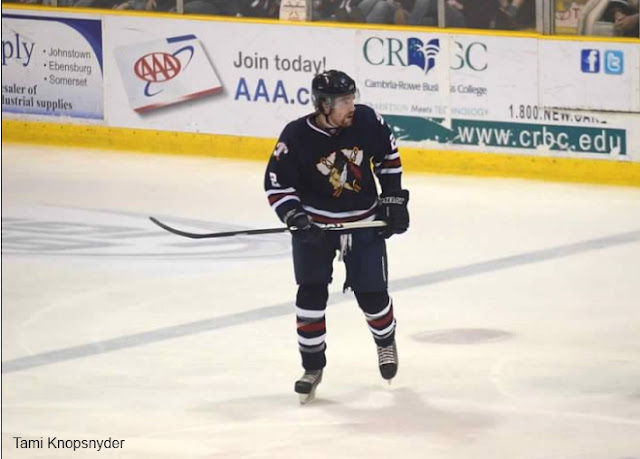 During the Tomahawks' Awards at the end of the season, Kessler was voted fan favorite. One of the reasons is that Johnstown loves tough guys, willing to do whatever it takes for their teammates. Kessler isn't the biggest guy in the league, nor does he drop the gloves every game, but when he does, you better look out. When he wasn't dropping the gloves, sticking up for teammates, he was playing solid defense and contributing on the offensive side of things. Just like Hall, Kessler had himself two game winning goals on the season. The first came against Michigan on 9/30/2012, and then against Michigan again on 10/14/2012. On that night Kessler scored a season high, three points (one goal, two assists) and ended the night with a +2. Kessler is another player that came with the team from Alaska. He played two less games last year but only registered 11 points, and was a +18. Kessler is that good "team player" type of guy that every team wants and needs. Bergh is a '92 which means this was his last year of junior hockey. He had career high numbers and finished with a +1.Bergh also played for the Alaska team before the team moved to Johnstown. Bergh is another player that you didn't always notice out on the ice but that just meant he was doing his job. He did however manage to score 24 points on the season in 49 games. Just like so many other Johnstown D-men, Bergh had two game winning goals. The first was against Jamestown on 11/23/2012, and the second game at Fresno on 12/08/2012. Bergh only had one fight this season vs Soo's Michael Crowley, but he never backed away from any scrums in front of his netminder between whistles. Bergh has good size as a defenseman. He doesn't have any college commitment that I'm aware of for next season. Hopefully he can find a school to play for or a pro-minor team that could use his services, because he's got the talent to keep playing. Fairchild lead the team in penalty minutes this season with 210 in 47 games. He tied Jamestown's Tyler Minx for the league lead in penalties. Fairchild also got himself six game misconducts or game ejections this season. He had some HUGE hits this season, but too many times, he hit guys high with elbows. Fairchild was another fan favorite because of his style of play, and even though he spent most of his time in the sin bin, he still was a +1 player. You could call Fairchild, The Rock, because like The Rock, he seems to have "The People's Elbow". Fairchild can deliver monster hits, but he doesn't have to do it to the head. I'm not going for player safety here, it's that, his high hits put the team on the penalty kill, sometimes for long periods of time. If Fairchild can contiune playing the way he plays but just control himself better, he'll perform better and so will the team. That being said, Fairchild was one of my more favorite players and I hope he's back with Johnstown next year. We saved Menslage for last because he didn't play a lot for the Tomahawks this season, so we didn't get a real good look at his playing style. Menslage didn't record a point in seven games that he played in for the Tomahawks. He did however have one fight, which came against Michigan's Mitchell Wedding. 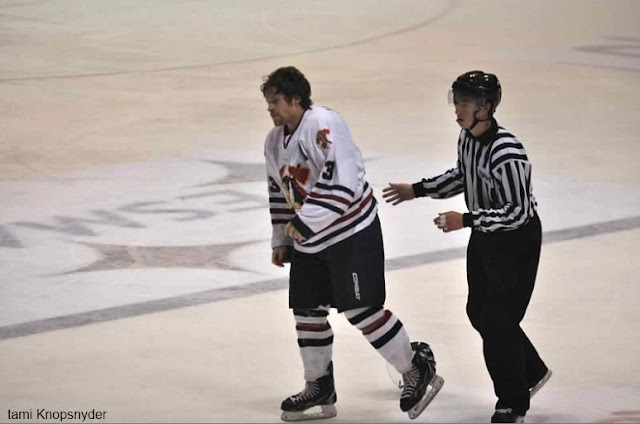 It was his first NAHL career fight. Menslage is a tendered player that the Tomahawks called up when they had a few D-men hurt. In his limited role this season, he wasn't that bad. As each game went on you could see he was building up his confidence. He stands at 6'3 210lb, great size for a defenseman. He is willing to drop the gloves which is another plus. 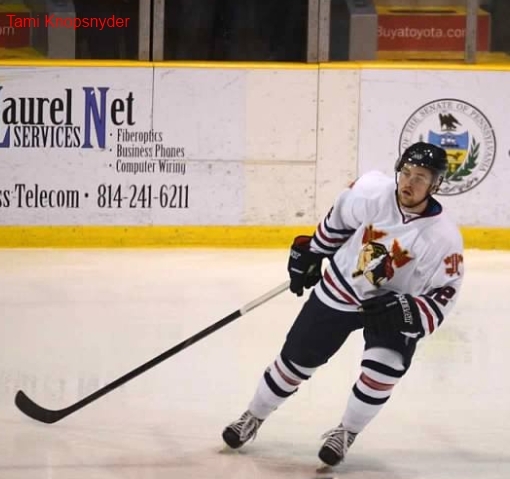 This season in the NA3HL in 20 games he register 11 points, was a +15, and had 76 penalty minutes. He only played a short time due to an injury vs the Soo Eagles back on 2/2/2012. The team didn't release what the injury was, but seeing the hit, I'd have to say it was a concussion, or an upper body injury. 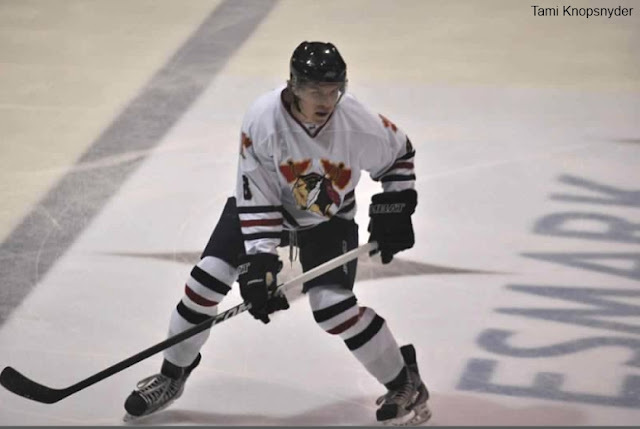 Hopefully Menslage returns to the Tomahawks for a full season. Projection: Maybe a more offensive Jake Fairchild. Bazevics was traded to get Johnstown native Corey Schafer. I like Bazevice and he seemed to have a pretty good shot, but never got that much ice time. Hansen came to Johnstown when the Alaska team relocated to Johnstown. He was another Jake Fairchild like player. The Tomahawks traded him on 11/13/2012, supposedly because he requested a trade because he wanted to be closer to home, so the team traded him to Topeka. Morris only played two games with the Tomahawks, both on the road so I can't tell you anything about him other then he was a monster, 6'7 194lb Defenseman. He was released by the team on 10/2/2012. 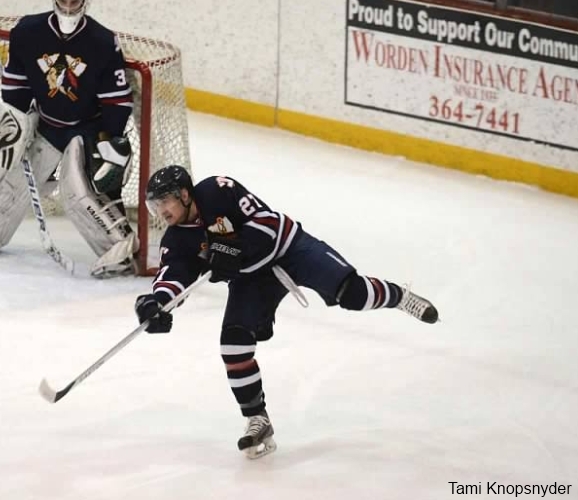 Later in the week we'll take a look at the forwards for the Johnstown Tomahawks. Stay tuned. Ian Spencer will be back in Johnstown next season. I was told the same thing. I overheard Spencer's mom saying that he is staying another year in Johnstown before going to college. Bergh hands down had the best passing game of all Tomahawks players. He made it look so easy and natural that most don't even notice that every pass was right on the tape - not in the feet, too far ahead or behind. Also, he stopped everything at the blue line - where it should be stopped. Great dman - hoping he finds another place to play - would like to see some more of this guy! I couldn't agree more. Bergh was a great player for us, and I hope he finds a good college to play for next season.